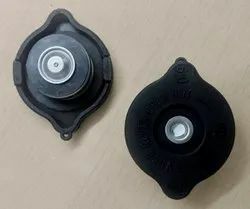 Radiator Cap with Plastic Top Cover is a variation of radiator cap with a nylon top cover instead of a sheet metal cover. The advantage of the top nylon cover design is that it ensures minimal errosion between the cover and the filler neck. Sheet Metal Top Cover comes with the inherent problem of errosion of the Plastic Filler Neck, which effects the efficiency and the durability of the entire cooling system.